The famous Holy cave temple of Vaishno Devi is the most revered Hindu temple located in the Katra town of Jammu & Kashmir state. This temple is dedicated to Shakti. As per Hindu mythology, the ruling deity of the temple which is also called as Vaishnavi or Mata Rani is the incarnation of Mother Goddess. The Hindus believe that a pilgrimage to the Holy cave will erase all sins of the previous birth and provide good health, prosperity and well being in the present birth. The deity is famous as the Mother who fulfills all the wishes of her children. The holy cave is located in the folds of the Trikuta Mountains. The statistics of the temple reveals that approximately ten million devotees throng the temple every year. The persistent belief that the mother will evade all the worries is making more and more devotees to visit the temple from within the country and abroad. The entrance to the cave is a narrow passage containing flow of cold water stream called the Charan Ganga. The pilgrim has to move in almost squat position through this to get into the main sanctorum. The main idols which are three in number depict the three mighty Goddesses the Mahasarswati, Mahalakshmi and Mahakali. As per mythological legend, Vaishnavi - the daughter of Ratnakar was believed to be the incarnation of Goddess Saraswati, Kali and Lakshmi. The purpose of her birth is believed to be the demolition of Demon Mahishasura. She is believed to have gained vast knowledge at a very young age and emerged as an ardent devotee of Bhagwan Vishnu. One day when she was meditating in the forest, a man called Bhairavnath charmed by her good looks, started irritating her to marry him. She ran away from the jungle and did not meet him again. She had to hide for 9 months in a cave to protect herself from Bhairavnath. She came out the cave and faced him boldly and finally beheaded him. Bhairavnath sought forgiveness to the mata and she instantly forgave him. This is the mythological importance of Bhairavnath. The temple of Bhairavnath was unveiled by a Brahmin named Pandit Sridhar who was a resident of Hansali village located on the top of the Trikuta Mountains. Pandit Shridhar went in search of Vaishnavi in the dense forest. On reaching the forest, he found that Vaishnavi was transformed into an eight armed beauty and was positioned on a lion. She intimated him that she is the incarnation of Goddess Saraswati, Kali and Lakshmi. The cave became famous from then and its holiness spread across the country. The Vaishno Devi shrine which is the popular religious centre for the North Indians is located in the small town of Katra in Jammu & Kashmir state. The prominence of the temple has attracted the devotees from south India also. 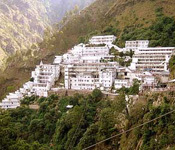 The temple of Vaishno Devi mata is located at a height of approximately 5300 ft above sea level. Devotees have to undergo a trek of 13 km from the Katra town to reach the Bhawan or the main sanctum. As per the available statistics, approximately 80 lakhs pilgrims visit the holy cave every year. It is also the second most visited temple in India after the famous south Indian Tirumala Tirupathi Balaji temple. The distance from Katra to the main Bhawan (The sanctum) is thirteen kms. The first stop after the commencement of journey is at the Banganga check post. Facilities for taking bath and free food serving bhojanalays are available here. Some of the exotic views of the valley can be had from here. The next halt is after a distance of two and a half km from Banganga at Charanpaduka. This area has a mythological importance as it is believed that this place contains mata’s footprints. The devotees reach Adkuwari after travelling three km from Charanpaduka. This halt marks the completion of half the journey to Bhawan. Here, you can visit Garbhajoon, which is believed to be the hide out of Mata. It was here that mata stayed for 9 months during her hide out from Bhairavnath. The devotees cover the next four km and reach the Sanjichat which is the last halt of the journey. This place is located at a steep altitude and gives an excellent view of Jammu, Udhampur, Reasi and Katra. The devotees are required to travel a distance of another two and a half km to reach the Bhawan or the sanctum. Further, journey of two km takes you to the temple of Bhariavnath which culminates the journey. People who are interested in the adventure activities can further trek to reach the dense forest which is full of wild animals like langoors, feral birds and monkeys. The walking track from Katra to Bhawan is full of refreshment stalls, which offers snacks like biscuits, milk, coffee, tea, mineral water and cold beverages. These refreshment outlets are run by the shrine board and are located at prime locations keeping in view the distance factor and to provide excellent view of the valley. Hence, they are also termed as View Points. The walking track is provided with twelve view points. Out of these nine view points are available on the old walking track and three are available on the alternate track which leads to the Bhawan. The refreshment stalls operating in the walking track are no profit, no loss stalls. Hence the devotees can get full value for their money. Also, the cleanliness and hygiene at these counters are specially taken care of. 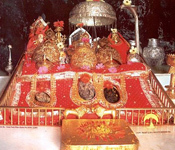 The Vaishno Devi Mata Temple is located on a hill top at a distance of fourteen kilo meter from the Katra town and Katra is located at a distance of fifty two kilometer from Jammu. It takes two hours to reach Katra from Jammu by road. Jammu is the nearest airport from the Holy cave temple. Pawan Hans helicopter service is operational between Jammu and Sanjhi Chat. It takes off in the morning. The travel one way would cost approximately Rs. 2,000. The journey would be for 15 minutes and baggage of 2 kg is allowed. The nearest railway station is at Jammu. It is a broad gauge railway station and well connected with all the major Indian cities. There are abundant bus services from Jammu railway station, bus stand and airport. Apart from this numerous interstate bus services are available directly to Katra. The journey from Katra to the Bhawan is a steep 14 km stretch. If there is a problem in walking you can hire a horse, pony, Doli or take the assistance from pithoo service. The yatra can be planned to visit and return back the same day. A healthy person would take approximately four hours to reach the temple top with sufficient rest and it may take another three hours to come down. Every devotee should be in possession of the Yatra slip, which can be generated online or obtained from the tourist information center near the Katra bus stand. Devotees will not be allowed to cross the Ban Ganga check post without the Yatra slip. It is a strenuous climb to reach the temple. The Shrine board has made elaborate arrangement of accommodation for the comfort of the pilgrims coming from far areas. There are numerous accommodations available at Katra, Jammu and on the walking tracks from Katra to Bhawan. Accommodation facility is available at Saraswati Dham and Vaishnavi Dham in Jammu which is located near the railway station. 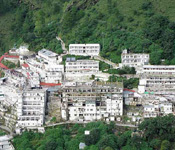 Niharika Complex at Katra is the place where you have to visit for Shrine Board accommodations. Shrine Board accommodation facility is also available at Sanjichat, Adhkuwari and Bhawan. Katra town is situated at an altitude of approximately 2500 feet above sea level. However, the main sanctum of the temple is placed at a height of approximately 5200 feet over sea level. This difference in altitude creates a major variation in the temperature between the two places. So, if you plan your trip as per the temperature and weather conditions of the Katra town you may have to face bad weather condition. The nights at the Bhawan are always cool even during the peak summer months. The temple is open round the year and devotees can visit the temple at any time of the year. However, the best time to visit the temple is between the months of March and September. Winter (October to February): The winter months are very harsh, the temperature usually dips below 00 and snow fall is also experienced. Summer (March to July): The climate during this period is very pleasant and this period coincides the vacation time. Hence most of the devotees visit during this period. Monsoon (August to September): The area receives medium to heavy monsoon during this period. This period is not very advisable for the Yatra as the walking tracks become slippery and there are chances of mud slides. But the nature remains at its best during this time of the year. The temple of Vaishno Devi remains open throughout the year. However, the summer months are the only pleasant period for visiting the temple. The winter season is extremely cool with occasional snow falls. The area is clearly visible in the summer season with the melting of the snow and provides a lively experience for the devotees in the nature’s paradise.